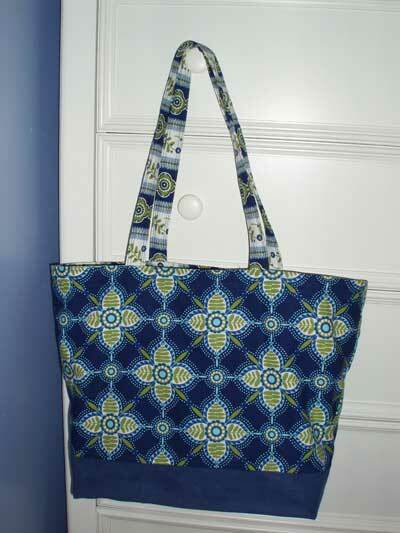 A Tote for Large Embroidery Projects! How do you store and carry your larger embroidery projects? I’m a fan of tote bags for both storing and toting, personally. I am a sucker for tote bags of all types! With that in mind, I thought I’d show off one of this year’s Christmas presents. Knowing I love tote bags, Mary Grace of Hooked on Needles sent me a fabulous one, and here it is…. The one thing I require in a tote bag is room – I have to be able to stick my embroidery project on the frame in the bag, along with all the tools, threads, and so forth required to complete the project. When I’ve got a needlework project stored up in a tote bag, I feel secure – like I can grab it and go at any time, even if I’m just going into the other room! A tote bag with a project nestled within is great for long trips, for short trips, for those times when you know you’re going to be sitting somewhere, waiting…. and waiting…. Well, in general, I just like tote bags for my projects! See the difference? 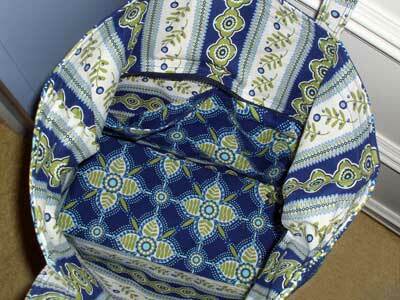 The inside facing of the bag – made from a coordinated fabric – is not sewn down to the inside of the bag. It folds out for added space, and it can still be zipped shut. Closing is important! Raindrops off roses, whiskers (and other hair) off kittens, dust that might settle and snow from my mittens – all must be kept off the embroidery! 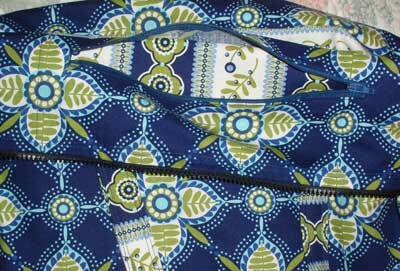 And so having a tote that expands in height and that zips closed is terrific! Roomy isn’t the word for this one – I can easily fit an 18″ x 20″ frame in here, along with all the necessities to complete the framed-up project. In fact, if I really wanted, I could pretty much fit all my current pending / possible projects in this bag! It’s very roomy. 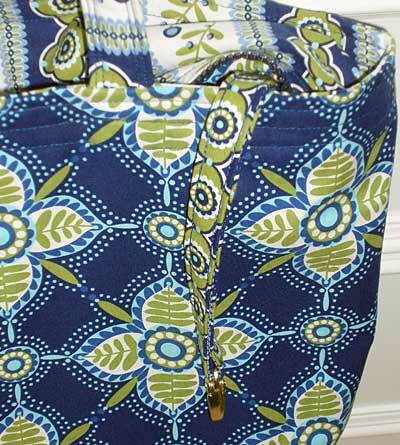 There are a couple separate pockets inside the tote. And there’s this little hidden pocket fitted inside the bag facing, where I can keep things I don’t want to lose. And – a nice little touch – there’s a key hook on a nice long strap. It’s a terrific tote! And the fabric is fun! And the construction and finishing – excellent! 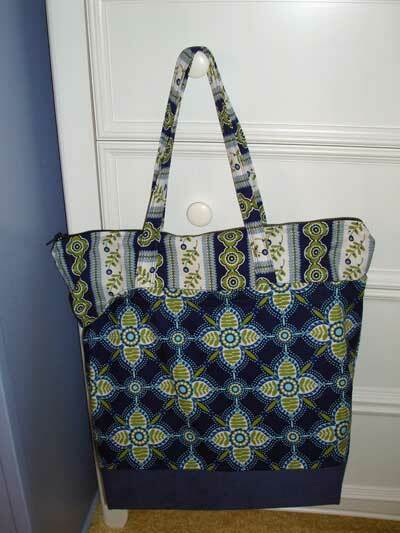 If you’re looking for a nice tote for your work and you’re not into sewing your own, you can contact Mary Grace at Hooked on Needles. Right now, it looks like she’s selling website samples and a few tote bags, but I’m pretty sure she’ll also do custom orders, if you have your own fabric and patterns. I was lucky to receive this as a gift, because we drew each other’s names for a Christmas swap. I bet you’re dying to know what I made and sent to her. I’m afraid I was a fink and didn’t send anything hand-made. But hey, I included some entertainment for her kids – some audio stories – which is even better! She can plug the kids in and sew in peace. See, I think of everything. Thanks, M-G! I love the tote, and it’s serving its purpose well! That tote is tote-aly the bee's knees. Funny saying but 'spose they need their knees as much as you and all of us need that tote. Reminds me of a quote I read recently. "A woman needs a man like a fish needs a bicycle"!!! Give the fish the bike, I say, and I'll keep my hubby. And, I'll keep all the wonderful tote bags I've bought from Op-shops too, despite my son's well meaning objections. None are the 'bee's knees' like your tote tho Mary. And I'll keep all the men's old and not so old ties I've gotten from the same source. I'll do something with them someday. I intend to embroider some of them. In the mean time I just like looking at them and displaying them on my old timber ladder with round rungs. I'm sure your return gift was enthusiasicly received. Unless, perhaps the kids short circuted when plugged in! Even so, you would not be a fink. Impossible for someone so generous. I love keeping my projects in tote bags. They are hanging off doorknobs in my living room, dining room, and hallway! I don't have any totes as beautiful as the one you are showing off today, though. Thank you for sharing, today, and every day! That is a wonderful tote bag. I went to look at her website and found that she also has a tutorial for those of us who like to make our own bags. I've added one to my myriad of projects. First I would like to say what good work your doing! And ask where do you find the time for all this?Your whole site is wonderful.Iam learning so much!Please never stop! BY the way I love canvas bags! I have them all over the place.Is the blackwork your new project? Hi, bluberry – thanks for your enthusiasm! I've got three new projects going: a goldwork project, a blackwork fish, and the floral glove needlecase, which is a combination of goldwork and silk embroidery. I'll be moving between all three projects in the upcoming weeks. I'm also going to set up one more project this weekend – something simple and "relaxing" – a spring flower design on the corner of a towel, to use as an Easter basket liner. I want to thank you for the article about the tote bag. I’ve been looking for a new one for a while, and liked the one you received as a gift. I contacted Mary Grace at Hooked on Needles and she made me a custom denim bag with red lining. I believe a picture is still on her site although I purchased it. I love it. It’s loaded with pockets and I love the flap that can be extended. The inside is beautifully finished with red and white fabric. She was a delight to work with, and I look forward to ordering from her again. I love this tote but I’m not sure it’s exactly what I need. I’m in the hospital & mostly bedridden. I love to read,, but I also want to get back to my needlepoint. With the limited amount of table & tray space they give you in hospitals, I don’t have room for more than one project at a time on my bed & can’t reach the next one when I’m ready. Would I need a stand with legs. I want something to reach that’s bed-height. Hi, Jessica – Sorry to hear of your plight! I think your best bet would be a stand, but I’m not sure how tall hospital beds are, and which stand would work best in that situation. Some that you might research include the Needlework System 4 (probably with the arm extension) and perhaps the Lowery, but I don’t know what the reach is on the Lowery stand. Hope that helps! Previous Previous post: The Crewel Rooster – on a Platter? Next Next post: Inspirations and an Embroidered Box. Hey. It isn’t Just Me!